US President gives long-waited announcement on US position on status of holy city of Jerusalem, pledges to move embassy to capital. 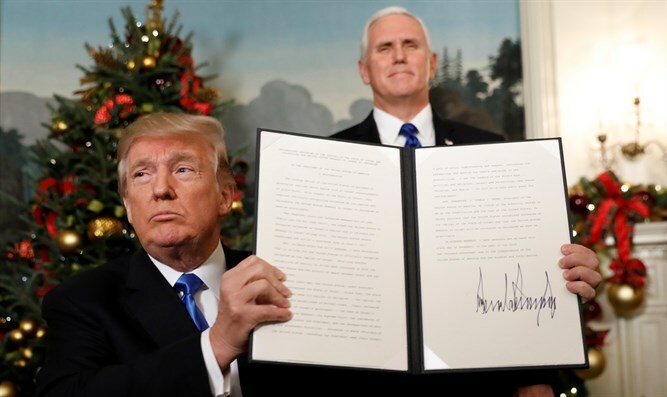 US President Donald Trump announced that the US government officially recognized the city of Jerusalem as the capital of the State of Israel and announced that the US embassy in Israel would be relocated to Jerusalem in a speech at the White House Wednesday. "After more than two decades of waivers, we are no closer to a lasting peace agreement between Israel and the Palestinians. It would be folly to assume that repeating the exact same formula would now produce a different or better result," Trump said. "Therefore, I have determined that it is time to officially recognize Jerusalem as the capital of Israel." The president said that Israel has the right to determine where its capital is located. "This is a long overdue step to advance the peace process and to work towards a lasting agreement. Israel is a sovereign nation, with the right - like every other sovereign nation, to determine its own capital. Acknowledging this as a fact is a necessary condition for achieving peace." He said that the State of Israel made its capital in "the capital the Jewish people established in ancient times." "Today, Jerusalem is the seat of the modern Israeli government. It is the home of the Israeli parliament, the Knesset, as well as the Israeli Supreme Court. It is the location of the official residences of the Prime Minister and the President. It is the headquarters of many government ministries. "Today, we finally acknowledged the obvious, that Jerusalem is Israel's capital. This is nothing more than a recognition of reality. It is also the right thing to do," he said. "That is why, consistent with the Jerusalem Embassy Act, I am also directing the State Department to begin preparations to move the American embassy from Tel Aviv to Jerusalem. This will immediately begin the process of hiring architects, engineers, and planners so that a new embassy, when completed, will be a magnificent tribute to peace," he added. The president said that the announcements were not meant to prejudge the outcome of negotiations with the Palestinian Authority or the final boundaries of Jerusalem, both of which would be left for "the parties involved" to decide.